Community ideas from a well-attended workshop turn a deserted market into an appealing public space with gardens, a playground, and Kosovo’s first skatepark. Kosovo is one of the poorest areas of Europe, with a long history of conflict between its Albanian and Serbian populations. Kosovo’s cities have experienced rapid growth in recent years, and there is a growing need for well-designed public spaces that can be enjoyed by everyone. The Municipality of Pristina was one of the first sites in Europe selected by UN-Habitat to test the Block by Block Methodology for upgrading public space. The initial project focused on revitalizing a former green market in Sunny Hill, one of Pristina’s largest and most populous neighborhoods. The site’s temporary market structures had been removed, leaving an abandoned, concrete-covered space that was rarely used by the community’s 4,000 residents. In September 2015, more than 70 Pristina residents participated in a Block by Block Workshop to redesign the former Sunny Hill marketplace. A Facebook page was created to share information and mobilize residents. After initial discussions on urban design and the importance of public space, the participants divided into small teams to model different solutions. The participants then co-created the final design on a multiplayer Minecraft server, based on the ideas generated by the teams. The designs were presented to a wide audience of urban professionals, including the mayor of Pristina. The final concept featured a range of facilities addressing the needs of various groups, including gardens, comfortable resting places, a playground, and Kosovo’s first skatepark. The 17 team proposals and the final concept were used as the basis for detailed architectural designs, which are now being built. The project has turned a deserted market into an appealing, multifunctional public space in the capital of one of Europe’s poorest countries. The success of the Sunny Hill project inspired another initiative in Mitrovica, 25 miles (40 km) north of Pristina. Mitrovica suffers from heavy unemployment and ethnic tension. The bridge over the Iber River symbolizes the traditional ethnic division between the Serbian and Albanian communities. The project aimed to revitalize the city market neighborhoods around the bridge, one of few areas in the city where the two communities meet. In October 2016, a Block by Block Workshop brought together residents of diverse ethnic communities from both sides of the bridge. 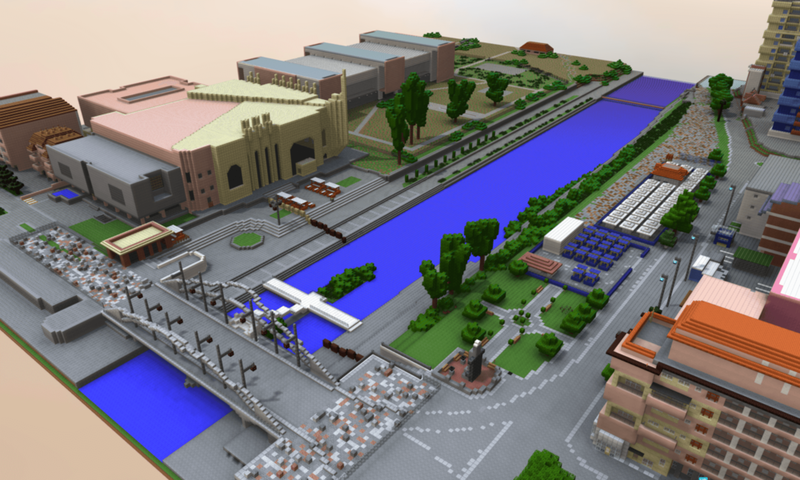 Using Minecraft to design ideas for the market neighborhood and both river banks helped the people think of Mitrovica North and South as one city. Designs developed in the Minecraft environment paved the way for a market concept emphasizing social and functional mixes, community interaction, and urban regeneration. Construction began in 2017. Kosovo is also exploring city-to-city cooperation mechanisms to accelerate progress on market management, urban revitalization, and socioeconomic development.